Eswatini is a country in Africa. It is officially the Kingdom of Eswatini (Umbuso weSwatini). Its capital is Mbabane. The country is named after the 19th-century king Mswati II. It was formerly called Swaziland until April 2018. Eswatini is a small country. It is no more than 200 kilometres (120 mi) north to south and 130 kilometres (81 mi) east to west. It is completely surrounded by land. Eswatini does not touch the sea. The two countries that touch it are Mozambique and South Africa. On 19 April 2018, the King of Eswatini Mswati III announced that the Kingdom of Swaziland had renamed itself the Kingdom of Eswatini. Eswatini is strongly affected by HIV and AIDS. The 2012 CIA World Factbook showed Swaziland with the highest HIV infection rate in the world. Life expectancy is 50 years. Education in Eswatini is free at primary level, mainly 1st and 2nd grades. It is also free for orphaned and vulnerable children. Children are not required to attend. In 1996, the primary school enrollment rate was 90.8%. Girls and boys both attended at the primary level. In 1998, 80.5% of children reached grade five. The University of Eswatini provides higher education. Most of Eswatini’s people are ethnically Swazi. There is also a small number of Zulu and White Africans, mostly people of British and Afrikaner descent. Swaziland also had Portuguese settlers and African refugees from Mozambique. 82.70% of the people are Christian, Christianity in Eswatini is sometimes mixed with traditional beliefs and practices. Some people think of the king as having a spiritual role. Eswatini also has a small Muslim minority. ↑ 3.0 3.1 3.2 3.3 "Swaziland". International Monetary Fund. ↑ 7.0 7.1 7.2 "Swaziland" "2001 Findings on the Worst Forms of Child Labor" Check |url= value (help). Bureau of International Labor Affairs, U.S. Department of Labor. 2002. Retrieved 29 December 2009. ↑ U.S. Department of State. "Background Note:Swaziland". Retrieved 29 December 2009. ↑ M. Paul Lewis (2009). "Ethnologue: Languages of the World, Sixteenth edition". Retrieved 29 December 2009. 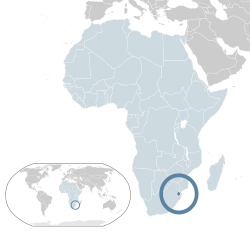 Wikimedia Commons has media related to Swaziland.